This little catfish from Lake Tanganyika is a surprise within a surprise; more — it's a gift! A small, easy to keep, peaceful, breedable wonder, well worth the keeping. Then why, do hear you ask, is it unknown to almost all of us? Well, little did I know beforehand, when I encountered Lophiobagrus brevispinis. It all started with a total mistake on my behalf and a quest for the wrong fish! When setting up my Tanganyikan tank I immediately set out on a search for the hard-to-get non-syno catfishes of Lake Tanganyika. After a year or two, I encountered some adult and young Lophiobagrus cyclurus. They were very difficult to get; some were obtained from Germany, and my adult pair came from a French hobbyist. My cousin was a catfish-nut like me and had a Rift tank too, so I set out to get him some Lophios as well. I had a big, nice surprise for him when a well-known LFS in Holland imported a box full of small Lophiobagrus from Burundi. I went to the LFS, got permission to catch a sexed pair (when viewed from above, this is easy: males are much broader than females, and have a bigger head), and brought him his catfishes. After some time, he even found a nest with babies in his tank. Swift action by me resulted in saving one tiny Lophiobagrus (shown to the right). So they even bred in captivity, a matched pair! My Lophiobagrus weren't interested in breeding, unfortunately. I ran into some bad luck with them, and ended up with a single L. cyclurus, which went into his tank. When comparing our fish, something struck. They were different. Exactly how different only became apparent when he quit keeping Tanganyikan fish. His cichlids went to the LFS, but his catfishes ended up at my place for obvious reasons! His Lophiobagrus were much smaller, the clear edges on all fins were absent, the eyes were too big, the body too slender; the list went on and on. Another species! But which one? It took a fairly long discussion on the Planet Catfish forum and some research to find out that my fish was Lophiobagrus brevispinis. Since then, I've kept and repeatedly bred this tiny gem. They turned out to be peaceful, shy and easy to keep catfish. They readily accept all kinds of food, showing up regularly at daily feedings. Though the parents have grown to adult size, they are still very small, about 5-7 cm. And like all other members of the Claroteidae family that have been bred in captivity, this one too provides very elaborate breeding care. They turned out to be bi-parental cave breeders, who look after their young for weeks on end. After a fairly long wait, the female became quite gravid and both parents started acting restless, swimming up and down the sides of the tank, even during the day. Here you can easily see the female's papilla and rounded belly (shown above, left). And then they disappeared! They went into one of the pipes and didn't come out again. After a few days, curiosity got the better of me. Time to get out the flashlight and the camera. The male had built up a sandy wall to close off the entrance, but there was still plenty of room for me to aim the flashlight's beam. Eggs! On the back wall of the cave was a fairly big blob of 1.5 mm eggs, pearly white in color and obviously very sticky. After a week or two, the eggs turned into a white mass of eggs-with-tails, constantly fluttering in their own gentle current. The parents hadn't left the nest even once. It was fairly obvious they weren't eating either, not even the finest morsels could tempt them out of that pipe. Another week later, several check-ups with the flashlight showed me that the fry had turned black, and were getting thinner and longer, rapidly using up yolk and getting ready to leave the cave. On one of those mornings I found the female, very thin, sitting in another cave. She had left the nest to the care of the male (who did a good job of it, by the way - see picture below). She showed no intention of going back, nor did the male show any intention of letting anything near the entrance of the cave - not even his mate. Another week later – we're well into 4 weeks after spawning – the male began to get restless as well. The babies tried to get out repeatedly, but the male wouldn't let them. I decided that I wanted to remove the fry from that nest and raise them separately. The next time around, I would leave the parents in peace and watch the whole show without interference. And that's exactly what I did. They were put into another tank, with the same water, sand and some pottery-pieces. Those babies behaved very oddly! They stayed very close together, in a black ball, constantly wriggling. They dug themselves into the sand by fanning their heads until a fairly deep depression was made, effectively hiding themselves from sight. I supplied them with microworms and freshly hatched brine shrimp. Only after a few weeks did they start to accept tiny bits of powdered flake, but it still took me a few months to wean them off the brine shrimp (I wasn't in a hurry to do so for obvious reasons). They stayed together in a tightly knit group for a long time. A few times I dispersed the group with a gentle movement, only to discover that within an hour, every little catfish was back in the hollow, together with its siblings. Only for dinner would they disperse. To this day — and they're 3 cm or so now — they still like to stay together, even if no longer in a single group (see below; fry during feeding time). Whenever I see a Lophiobagrus youngster, I can count on several others being close by, sharing the same hide-out. Now they eat the same food that their parents do. Although there are reports that some Lophiobagrus species are bi-parental mouth-brooders, this was definitely not the case with my fish. Nowhere during the breeding cycle did mouth-brooding occur, not by the male, nor the female. The fry hid in the back of the cave and even when provoked — by me — no parent scooped them up, although they attempted to block the cave with their bodies. Other aquarists who have spawned Lophiobagrus cyclurus also report clusters of extremely sticky eggs clinging to the cave walls. Thus, if these species are in fact mouth-brooders, they must be facultative mouth-brooders at best (i.e., they can mouth-brood their fry but can also raise their fry by other means). Hopefully more of these tiny Tanganyikan wonders will reach catfish enthusiasts everywhere. They're definitely easy to keep, and can be combined with even the smallest cichlids, as they're completely harmless. 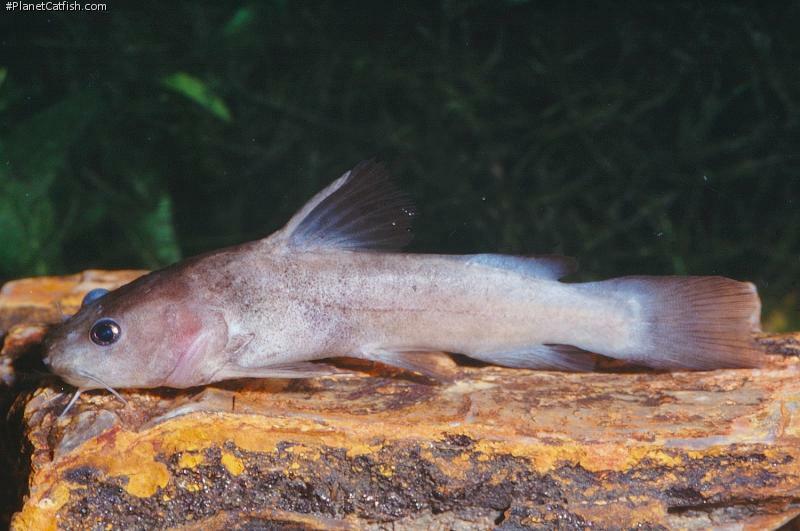 There's definitely more to Lake Tanganyika catfish than just Synodontis. Lophiobagrus brevispinis may well turn out to be the catfish from the Rift for people with smaller tanks. ED: This article was written by Alex AKA "sidguppy"; a certified "planet catfish irregular" and long time African catfish devotee. Alex modestly avoids mentioning that this is the first recorded spawning of this species. Thanks to him, this knowledge is now shared and hopefully we will see more successes of this ilk in the future. Type Locality Lake Tanganyika, 2 km north of Mpulungu, Zambia. Etymology Lophiobagrus: The name comes from the broad, depressed anterior region of the fish, which reminded Poll of the angler fish (Lophius piscatorius). - Much more elongate build. - Larger eyes that protrude above the head giving a ''frog'' like head profile. - No clear edges on any fins! -A rounded caudal fin, instead of truncate like L. cyclurus. - Lighter overall color; reddish brown with a white belly; instead of wine-red turning to black in L. cyclurus. Sexing Males are larger. When viewed from above, males have a large, broad head, females a rounded belly. The genital papilla on the female is only obvious near spawning time. Distribution Lake Tanganyika. Although exported from Burundi, it?s likely to have a lake-wide distribution. Other Parameters Moderately hard (10+ GH). Water should be clean and oxygen-rich, especially when attempting to breed. Feeding Readily accepts flake and frozen food, but especially relishes live food such as crustaceans, insect larvae, small fry and worms. Furniture Lots of rocks and hiding places. Because of Lophiobagrus? digging habits, sand is best for substrate, gravel is not suitable, unless very fine. Compatibility L. brevispinis is a social fish which should be kept in a small group, but with enough hiding places, at least one for every fish. Single specimens are very shy. Suggested Tankmates Any not overly aggressive cichlid-species is suitable, and they can be kept with other Tanganyikan catfish like Synodontis or Phyllonemus. When combining with L. cyclurus, make sure there's room and plenty of caves, or the more peaceful L. brevispinis may be harassed by the bigger, more aggressive L. cyclurus. Breeding Bi-parental cave breeder. Parents show elaborate care for both eggs and fry, and will remove or eat spoiled eggs or dead fry, as well as defend the cave. The fish will remain in a cave for at least three weeks! During that time no food is taken at all. Often the female leaves after two or three weeks due to hunger, leaving the male to complete the rearing of the fry. In aquaria well stocked with cichlids, the female will stay with the male during the whole breeding cycle.